Collars are useful accessories for cats which can not only keep them safe, identify them and help them stand out to drivers at night, they can also keep them healthy. Our collection of cat collars includes plain and patterned collars, novelty designs, flea collars, reflective options and more. We also stock a number of accessories including bells and ID tags to help outdoor cats find their way home should they get lost. 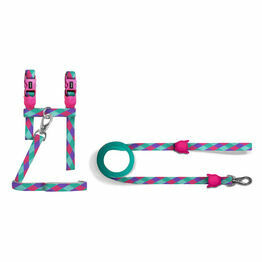 For housecats who may need to go out into the world, our collection of harnesses and leads are all designed for maximum safety and comfort. Please browse our full collection of cat leads, collars and accessories to find everything you need for your beloved pet.